The Heikin-Ashi candles are one of the most popular indicators used by technical traders to identify a given trend more easily. The term simply means “average bar”, in Japanese. The main purpose of Heikin Ashi charts is to filter noise so as to provide a clearer visual representation of the trend. This makes understanding and interpreting trends easier for new traders. 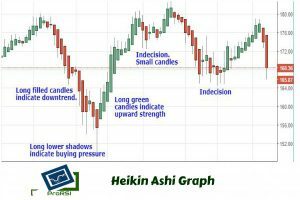 Experienced traders too are benefited from the Heikin-Ashi candles as it helps them keep them identify the trending trades and spot reversals, along with traditional chart pattern setups. It is often used in conjunction with candlestick charts for prediction of future prices, however, there are various points that make reading the Heikin Ashi candles a bit different than the traditional candlestick chart. In Heikin-Ashi candles white (or green) candles with no lower shadows are used to signal a strong uptrend. These are generally hollow to look. On the contrary, black (or red) candles with no upper shadow are used to identify a strong downtrend. Use a Heikin Ashi chart to catch longer and persistent trend as trend detection by emphasising the persistent trends is one of the major functions of Heikin Ashi charts. Small corrections and consolidations do not come in the picture as they are too small to be visible on the chart. A new price move takes a new direction on the Heikin Ashi graph, which thereby helps to distinguish between the potential beginning and the end of a stock with filtered noises. Also, many traders combine the soothing benefits of the Heikin Ashi chart with a trailing stop indicator and triangle and flag patterns to get the most of out a trending market condition and interpret price action rules. Heikin-Ashi charts are most applicable to trend traders as they help traders view trends and spot potential reversals. A strong trending move changes dramatically the of the appearance of Heikin-Ashi candles. Long upward candles with very little or no lower shadows are prominent in case of upward trends. The thinly lined shadows extending out from either side of the candle known as the real body, are the representation of the maximums and minimums of the Low, Open, Close and High. When a strong uptrend is underway in the market and the buying is aggressive, the lower shadows does not appear. Additionally, the pullbacks are indicated by red bars as well with lower shadows. This effectively means that the trend is in a corrective phase. Heikin-Ashi candles need a breakout or a major shift in price just like other traditional charts in order to spot a reversal or trend continuation. Thus the correct knowledge of Heikin-Ashi candles combined with other technical analysis concepts helps spot reversals and positional trades. Ease of application and interpretation is what makes Heikin Ashi charts appealing to traders. Using Heikin Ashi price bar helps to determine trend strength during low trends and also help to isolate major price reversals.